MIT Technology Review: Scientists at the Computational Story Laboratory have analyzed novels to identify the building blocks of all stories. 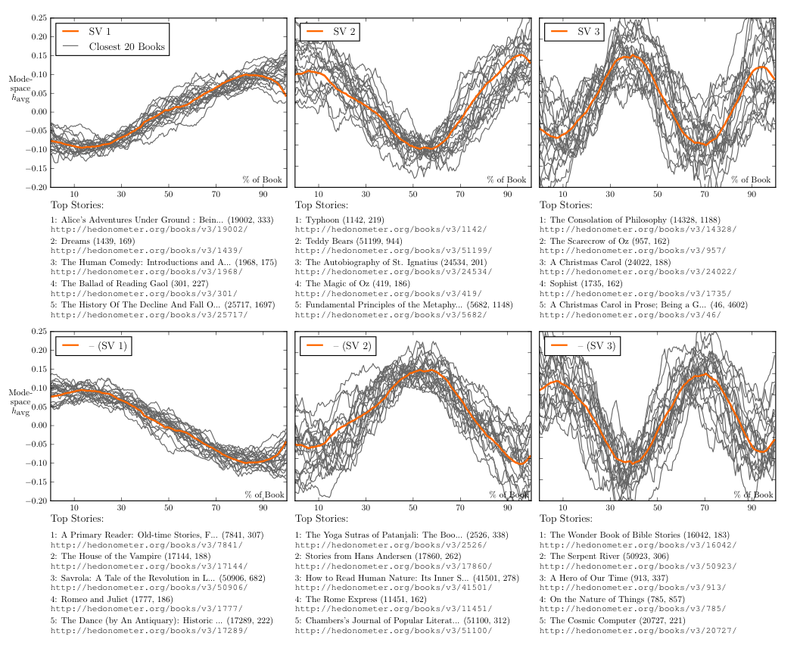 Sentiment analysis was used to map the emotional arcs of over 1,700 stories. Then data-mining techniques revealed the most common arcs. Their method is straightforward. The idea behind sentiment analysis is that words have a positive or negative emotional impact. So words can be a measure of the emotional valence of the text and how it changes from moment to moment. So measuring the shape of the story arc is simply a question of assessing the emotional polarity of a story at each instant and how it changes. A steady, ongoing rise in emotional valence, as in a rags-to-riches story such as Alice’s Adventures Underground by Lewis Carroll. A steady ongoing fall in emotional valence, as in a tragedy such as Romeo and Juliet. A fall then a rise, such as the man-in-a-hole story, discussed by Vonnegut. A rise then a fall, such as the Greek myth of Icarus. Rise-fall-rise, such as Cinderella. Fall-rise-fall, such as Oedipus. Source: The Emotional Arcs of Stories Are Dominated by Six Basic Shapes, paper by Andrew J. Reagan, Lewis Mitchell, Dilan Kiley, Christopher M. Danforth, Peter Sheridan Dodds. The Shapes of Stories, a Kurt Vonnegut infographic — Kurt Vonnegut believed that a story’s main character has ups and downs that can be graphed to reveal the story’s shape. The shape of society’s stories, he said, is at least as interesting as the shape of its pots or spearheads. This is very interesting. The illustration is brilliant. Thanks for sharing this.